In May 2018, three samples of wild garlic mustard (Alliaria petiolata, Brassicaceae) were collected from a private garden in Koenigslutter, Germany. While sample EPV_18_002 was asymptomatic apart from slight yellowing, samples EPV_18_003 and EPV_18_004 showed stunting, yellowing, necrosis and severe crinkling (Figs. 1-3). It was possible to mechanically transmit the suspected virus from all three samples to Nicotiana benthamiana; the same systemic symptoms of leaf crinkling, rolling and yellowing appeared seven days post infection on all plants, and the plants died in the second week. Infected N. benthamiana leaves were analysed by electron microscopy and icosahedral particles of c. 30 nm in diameter were observed that reacted with antibodies (Julius Kuehn Institute, reference number JKI-1177) raised against a UK isolate of Turnip crinkle virus (TCV) (Fig. 4). To obtain the full viral genome, dsRNA was extracted from symptomatic N. benthamiana leaves (inoculated from sample EPV_18_002) using a Viral dsRNA Extraction Mini Kit for Plant Tissue (iNtRON, South Korea) and sent for library preparation and sequencing on Illumina NovaSeq 6000 platform (2x150 bp) at Eurofins GATC Biotech GmbH, Germany. Using Geneious Prime (2019.0.4), the raw reads were quality trimmed, filtered, error corrected and normalised, followed by de novo assembly. A BLASTn search of the generated contigs confirmed the presence of eight contigs (131 to 4,057nt) with nucleotide (nt) identities of 82.3% to 86.7% to TCV (NC_003821); there was no indication of the presence of satellite RNAs. The full genome of the German TCV isolate (JKI ID 29306) was assembled using this reference genome. The complete genome of TCV-JKI-29306 was 4,061 nt (accession no. MK301398). The presence of TCV was confirmed in all three original samples by RT-PCR using OneTaq One-Step RT-PCR Kit (NEB, USA) with the primer pair (HZ632 5'-AAAGGCAAAACTGGGTGGGA-3' and HZ633 5'-TAAAGTTTGCGGCTAGGGG -3') generating a 339 bp fragment. In further comparisons using MUSCLE (3.8.425, Edgar, 2004), the German TCV isolate shared 82.8% nt identity to NC_003821 and 82.6% to AY312063 (Table 1). Additionally, the protein sequences of the different TCV genes shared identities of 75.0 to 90.7% to the proteins of NC_003821 and AY312063 (Table 1). According to ICTV criteria, these data indicate the presence of a novel TCV strain (Rochon et al., 2012). 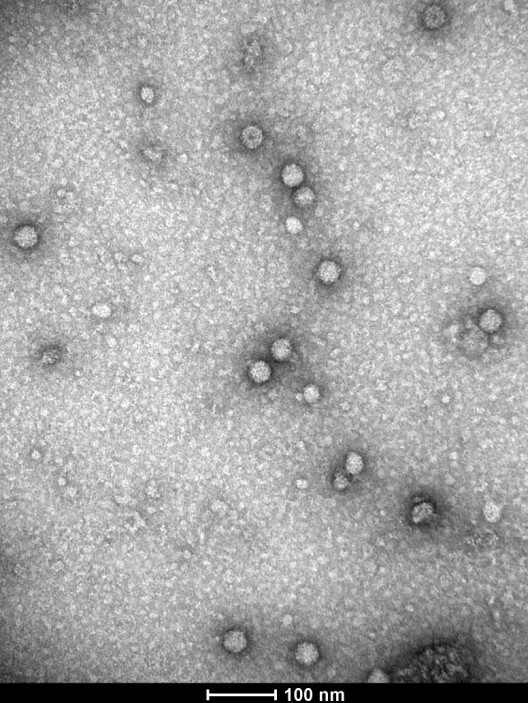 TCV belongs to the genus Betacarmovirus (family Tombusviridae). It infects members of the Brassicaceae family causing crop losses (Broadbent & Heathcote, 1958; Lister, 1958). 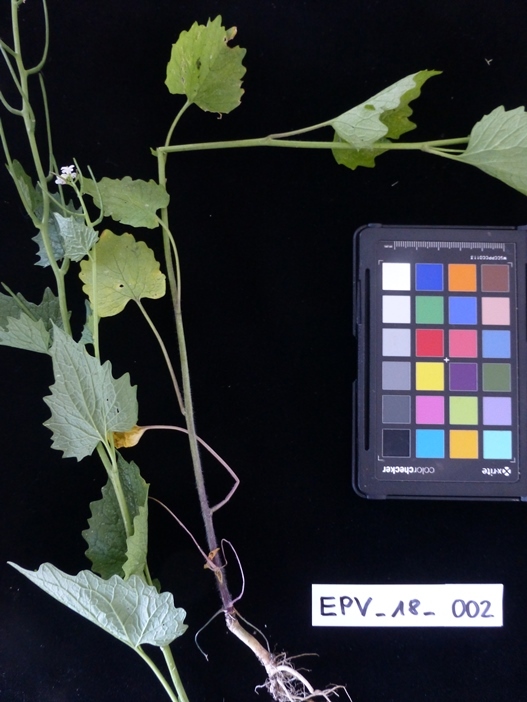 To our knowledge, this is the first report of a TCV strain from Germany occurring on garlic mustard. Although TCV is one of the model organisms in plant virology and therefore well studied, there is surprisingly little literature available on occurrence, host range and impact of this virus. As the original host plants appeared as weeds in a private garden (approximately 40 plants with a minority displaying symptoms), the impact of TCV in Germany and other countries on cultivated crop plants is currently unknown. 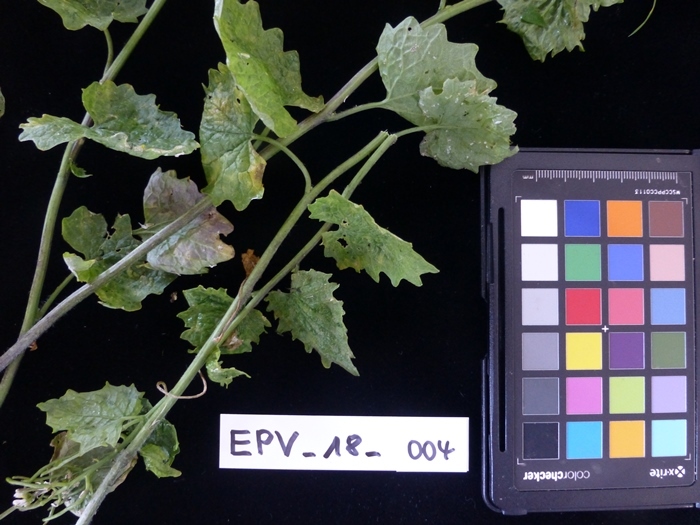 Figure 1: Sample of garlic mustard infected with Turnip crinkle virus. 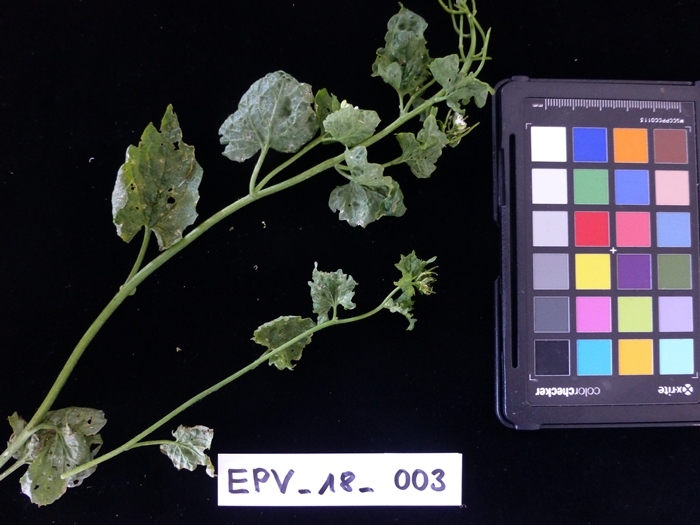 Figure 2: Sample of garlic mustard infected with Turnip crinkle virus. Figure 3: Sample of garlic mustard infected with Turnip crinkle virus. Figure 4: Electron microscope image of Turnip crinkle virus (TCV) from infected Nicotiana benthamiana leaves. Particles were decorated using a TCV-specific antiserum (JKI-1177). This work was financed by the Euphresco network 2015-F-172 "NGSdetect". Y. Gaafar was supported by the GERLS scholarship. Rochon D, Lommel S, Martelli GP, 2012. Family Tombusviridae. In: King AMQ, Adams MJ, Carstens EB, Lefkowitz EJ, eds. Virus Taxonomy. Classification and Nomenclature of Viruses. Ninth Report of the International Committee on Taxonomy of Viruses. London, UK: Elsevier Academic Press, 1111-1138. New Disease Reports is an international online peer-reviewed journal published by the British Society for Plant Pathology (BSPP).